Sets: Naïve, Axiomatic and Applied is a basic compendium on naïve, axiomatic, and applied set theory and covers topics ranging from Boolean operations to union, intersection, and relative complement as well as the reflection principle, measurable cardinals, and models of set theory. Applications of the axiom of choice are also discussed, along with infinite games and the axiom of determinateness. Comprised of three chapters, this volume begins with an overview of naïve set theory and some important sets and notations. The equality of sets, subsets, and ordered pairs are considered, together with equivalence relations and real numbers. The next chapter is devoted to axiomatic set theory and discusses the axiom of regularity, induction and recursion, and ordinal and cardinal numbers. 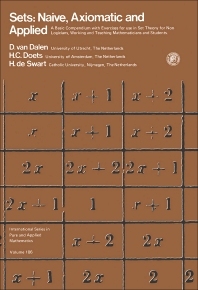 In the final chapter, applications of set theory are reviewed, paying particular attention to filters, Boolean algebra, and inductive definitions together with trees and the Borel hierarchy. This book is intended for non-logicians, students, and working and teaching mathematicians.